Sina turned seven on Wednesday. For her birthday, she received not only congratulations and private gifts, but also a neon yellow safety vest. On behalf of the ADAC Foundation, Brigitte and Wolfgang of the AMC distributed a total of 67 of these free clothes to the first graders of the elementary school. “School in sight. Kids in view “is the motto of the campaign this year. Wearing the vest gives children and parents additional safety on the way to school. But in the spare time, the vest should always be worn, said AMC Chairman Wolfgang. In the dark, the first graders with the reflective material would be seen from a distance of 140 meters. This year, 760,000 safety vests will be distributed nationwide to new school children. Partner of the campaign is the Deutsche Post DHL Group. The company handles the entire logistics of the 30,000 parcels to the 16,000 elementary schools and calculates no costs. Axel Wattenberg, the chairman of the des Grundschule, also regretted the decision of the ADAC Foundation. He was in favor of at least providing the first graders with the vest. “As a development association, we will find a solution,” he said. Andrea from the ADAC Foundation in Munich confirmed the end of the action. The ADAC Foundation bundles the public interest activities of the ADAC. “Accident prevention is still one of our core tasks, as stated in the statutes,” she explained. 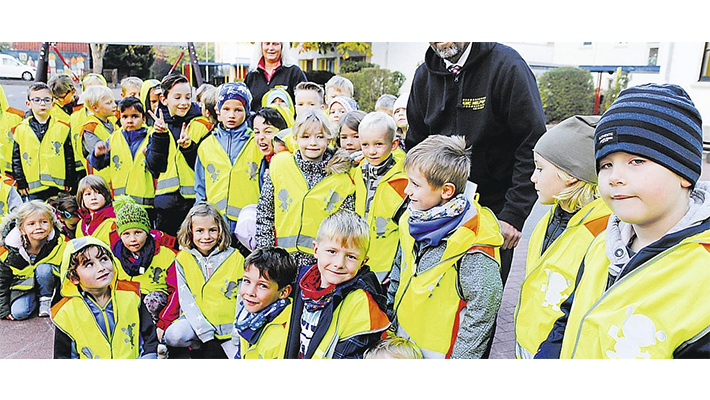 “However, we will restructure the funding priority.” How the ADAC Foundation wants to address the youngest road users in the future has not yet been decided. A first step was already done with the project “Roller Fit”. With the concept, elementary school teachers can design exciting traffic education lessons for children under the age of eight. With the help of scooters, the nationwide project should help ensure that children participate more safely in traffic before they even get their cycling license. According to Ralf, the children are already sufficiently equipped when they start school. The spokesman, health insurance and others were “jumped on the train” and would, distribute even in kindergartens with warning vests. In addition, it was not successful, the action sustainable. Despite several incentives such as sweepstakes children do not wear their vests after a short time. Another argument was given by Tobias of ADAC. The decision has financial reasons, he said. Because German post-DHL as cooperation partner of the action does not want to take over the dispatch free of charge any longer. “It would be too expensive for the ADAC alone,” he said. From the post office in Bonn, no comments were received. “We do not give any details. These are contract contents,” said spokesman Rainer, leaving room for interpretation.